All our Children's Worship Bulletins are biblically based and educationally sound. In our new bulletin series of special days and holidays, you'll find children's church bulletins about Ash Wednesday that enables you to tie this special day directly to Scripture. 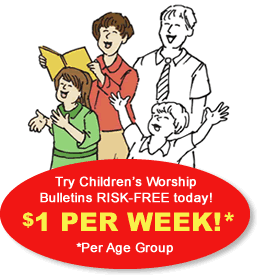 Children's Worship Bulletins are reviewed by educational specialists and tested by children. Messages included in each are basic, positive and acceptable to all Christian denominations. Use our children's church bulletins about Ash Wednesday with confidence that the content is both appropriate and fun. In this short article, we show you how to create activities based on our children's church bulletins about Ash Wednesday for kids ages 3-12. Use them in your Sunday school class or as part of your church's youth educational programming. By using these activities, you'll teach children what Jesus tells us about the importance of storing our treasure in heaven. Read aloud Matthew 6:1-6, 16-21. Give each child a bulletin, crayons or colored pencils, a pair of scissors, the cardstock handout and a glue stick. Explain the activity, "In our Scripture lesson, we learned that God wants us to look for our treasure in heaven. Today, we're going to create a stained glass poster to remind us of this important lesson. First, in the puzzle 'For where your treasure is, your heart is,' color the spaces marked '1' in blue, the spaces marked '2' in green, those marked '3' in yellow and those marked '4' in red. Then, cut out the stained glass rectangle and glue it to the poster handout. When the children have finished their posters, allow them to show their work to their classmates. Read or have a volunteer(s) read aloud Matthew 6:1-6, 16-21. Explain the activity, "In today's Scripture lesson, we learn how Jesus wants us to live. Who can give me one of the examples that Jesus used in this lesson?" Accept any answer, such as "give to the needy without letting anyone else know about your donation," "pray in private," "fast with a happy face" or "practice your righteousness in front of others to be seen by them." Continue, "We're going to solve a puzzle in our bulletin to reinforce the lesson we read in Scripture. We'll divide into teams. I'll pass out a bulletin and pencil to each team. After I yell, 'GO!' the first team to complete the crossword and fill-in-the-blank puzzles will win. Distribute a bulletin and pencil to each team. Yell, "GO!" and wait for the first team to finish. Confirm that the puzzles were solved correctly by having the winning team read aloud its answers. Make sure to give everyone their own bulletin to take home.